Archipelago Ventures Ltd. has been providing a commercial charter and adventure tour service on the Islands since 1980. All of our captains and guides have been long time residents of the Charlottes (one was born in Queen Charlotte City!) and know the islands well. Over those years we have provided a warm and friendly alternative to exploring the more remote corners of Haida Gwaii (Queen Charlotte Islands - see map). 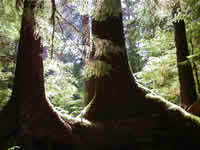 We are licensed to operate in Gwaii Haanas National Park Reserve and are committed to the preservation of the unique environmental and cultural values of the Queen Charlotte Islands. We're members of the Gwaii Haanas Tour Operators Association which liaises with Parks Canada to ensure a high quality experience for all visitors to the Park. Our trips are full of learning opportunities, new experiences as well as relaxation and good times. collect and remit Parks Canada "User Fees"
All of this costs. Operating in a tough north coast marine environment is not cheap either. All of this is to say that what seems like an expensive trip is expensive for a reason. What you get however, is a high quality experience in a very uncrowded wilderness setting. Parks Canada not only regulates business activities but visitor numbers as well. 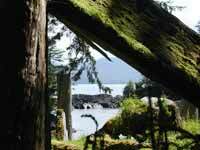 Approximately 2,000 people visit Gwaii Haanas National Park during the entire year. To put this in perspective, something like 4,000 people an hour pass any given point on the Stanley Park sea wall in Vancouver on a nice Sunday afternoon..